The New Framelits dies make it so easy to create extra special Valentines. The three layers of different size hearts really draw your eye to that center heart. Don't you love things that sparkle! Its cut from Red Glimmer Paper. 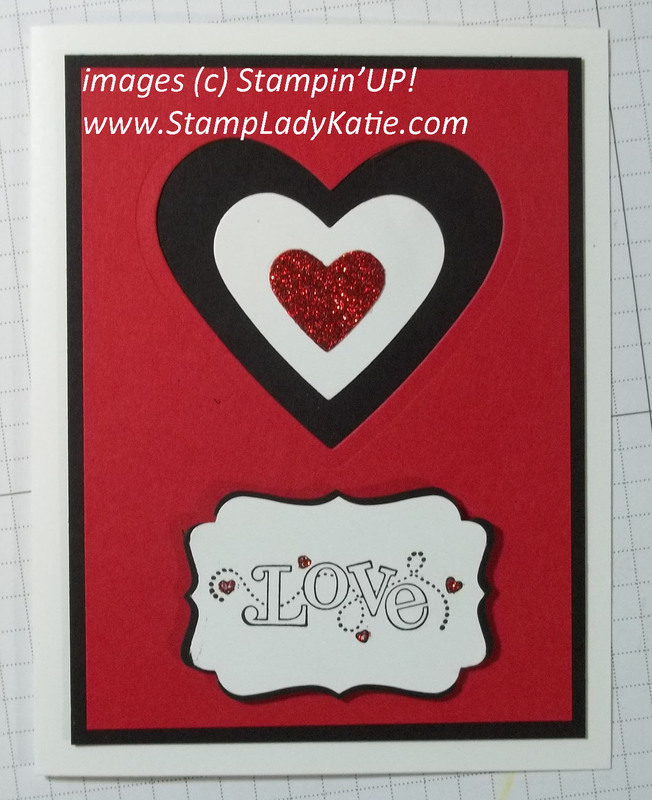 Click HERE to see a Stampin'UP! video explaining more about the Framelits. The Glimmer Paper is wonderful. Its thick and sturdy and the glitter does not fall off. Even though its a little thicker than the regular colored cardstock, the framelits die had no problems at all in cutting through it. I like to make sure my cards are balanced. I try to balance color, interest and weight. The word at the bottom needed a little something to balance the color and sparkle at the top of the card, so I added a little red Dazzling Details (our new glitter glue). It was the perfect solution for this card. By the way, if you're wondering how to get the layers on the sentiment using just one punch then be sure to check out the photos from this snowman card. I have photos there explaining the trick. Are you "dieing" to make some sparkly valentines like this? Here are the supplies you'll need. The Stamp Set used on this card is a Sale-a-Bration item. 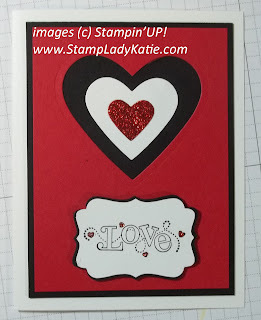 The word "love" on this card is from my favorite Sale-a-bration set called: Outlined Occasions. You could get this set FREE with a $50 order. Assuming you already have red, black and white paper, if you bought the rest of the supplies to make this card the total comes to $51.35, which is enough to earn you this set, or any of the Free Sale-a-bration items.